Boutique cake studio The Pink Kitchen recently relocated from their East London premises to their new Otford studio in Sevenoaks Kent, where elegant cakes that are as delicious as they are beautiful are now crafted. The cakes are bespoke in design and taste, baked to order with the utmost care and expertise, using fresh quality ingredients. Intricate sugar flowers – their specialty - make the cakes a real sight to behold. 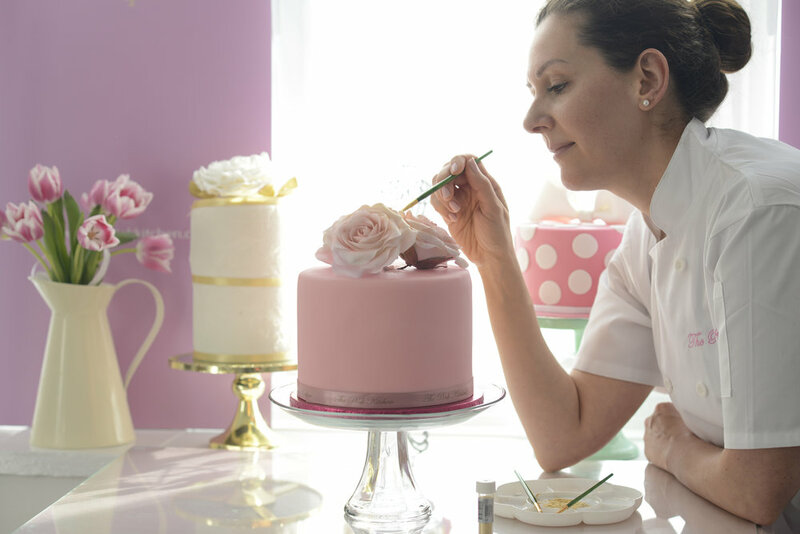 The cake designer behind The Pink Kitchen, Aline Wickens, is a pastry chef with more than 10 years experience, and has catered for events at the Houses of Parliament, Kew Gardens and many prestigious wedding venues around London. On top of the timeless style The Pink Kitchen bring to their cakes, the studio also has a tempting selection of cupcakes and popcakes, so you are certain to find something delicious for any event. If cake alone is not enough, they also create complete dessert tables and displays. Aline will work with you to meet your brief, taste and budget, delivering memorable creations for your special occasion. The cherry on the cake for our readers with a vegan lifestyle The Pink Kitchen has a delicious range of vegan cakes and caters for specifically eggless and dairy free requirements. Very soon, some of their fabulous celebration cakes and cupcakes will be available to be purchased online and delivered to your door. We are delighted to share a blog post by So Many Lovely Things ! Check it out. Thank You Dani Dutra for your sweet words. Thinking of adding a dose of pink glamour to your wedding? I don't blame you! I had the pleasure of collaborating with a wonderful team of wedding suppliers to put together our collective take on the timeless glamour and sophistication of our wedding dessert table. Our palette was a mix of blush pink with touches of gold. The vintage yet luxurious details are a great way of adding some extra character to the wedding decor. I absolutely love the floral created on this white lanterns set amongst the cakes. Three of our vintage collection cakes, vintage cake pops and pink cupcakes were set on the table by Eliane Teodoro at Shekinah events London and hosted by The Alexandra pub in South London. For the wedding cakes, a vintage theme provided lots of inspiration, from the classic art deco shapes to the vintage beading. I wanted a modern look so I used a lovely shade of pink pastel with touches of gold finished with some pink sugar flowers, gold leaves and berries. The 1920's inspiration on this wedding cake shows that simplicity can emphasise elegance. Pink sugar roses with sprinkles of gold on a pink pastel stripped wedding cake is a perfect choice for a vintage wedding too. The vintage cake pops were decorated with sugar flowers, sugar leaf and gold dust. The vintage gold mirror brought a fantastic look to our wedding dessert table decor. I can't express in words how grateful I am to have been involved in the collaboration with Eliane and Isabella. Thank you girls for the hard work and the amazing day. I love working with chocolate ganache, its is perfect and delicious for any occasion. If you are not a big fan of buttercream here is an easy chocolate ganache recipe for your cakes, cupcakes and tarts. The secret to get a perfect silky consistency of this chocolate ganache is to first of all, use high quality chocolate and secondly, be patient and enjoy it. Attention.. Allow the ganache to sit at room temperature overnight. 1.Place the chopped chocolate, diced butter and honey in a medium bowl and set aside. 2.In a saucepan, bring the double cream to boil at a medium-high heat. 3.Pour the hot cream over the chocolate, butter and honey. Immediately stir with a whisk until smooth and shiny. The chocolate will often settle, so make sure to mix it well. 4.Cover the bowl with cling film. 5.Allow the ganache to sit at room temperature at least 8 hours but preferably overnight. 6.This gives you a gorgeous and shiny chocolate ganache that is perfect for piping cupcakes, filling tarts or layered cakes. Our first Afternoon Tea was so sweet and very Pink ! It was held in an amazing historical place called Trinity Green where The Pink Kitchen London studio is located. Everything was beautifully presented, wonderfully fresh and delicious. The girls were treated to fresh cheese sandwiches, vegetarian canapés, mini Victoria sponge cakes, vegan chocolate truffles, coconut and chocolate cups, cheesecakes and floral cupcakes. The Pink Kitchen had the honour to participate and show our delicious brazilian truffles at the Brazilian Taste Show 2017 in London. It was a busy and a wonderful weekend at the show with Brazilian food workshops by brazilian chef's from all over Brazil and in addition some great exposers and brazillian products. We were delighted to be part of this lovely day. Esttfani and Jose had their wedding in South London, it was a really elegant day with a beautifully minimal theme. The green and white colour scheme gave a wonderful natural touch to the room, we provided a lovely delicate wedding cake decorated with white sugar roses and green sugar leaves to fall in line with the natural green and white floral decor of the venue. We had a great time at the Luxury Wedding Show, meeting vendors and clients. Café de Paris, in London's Piccadilly is one of the most famous entertainment venues in the world. With a glittering history, spanning more than nine decades, Café de Paris has consistently played host to a wide variety of powerful & absorbing performers and guests, members of the aristocracy, eminent political figures, dazzling pop stars, captains of industry, superstars from the silver screen and even royalty.